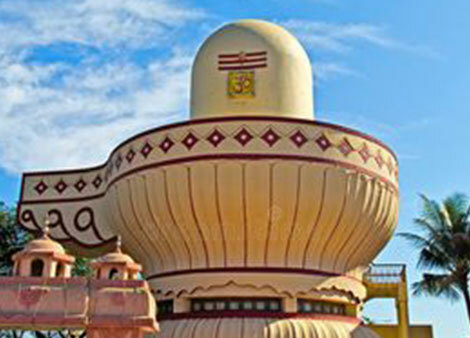 Shree Somnath is a holy place of the Aadi Jyotirling Shree Somnath Mahadev and the sacred soil where from Bhagvan Shri Krishna took his last journey to his neejdham. The temple is built at the shore of the Arabian ocean on the western corner of Indian subcontinent. This pilgrimage is one of the oldest and find its reference in the ancient texts like Skandpuran. The arrow of the poacher named Jara at this spot hit Bhagvan Shree Krishna. 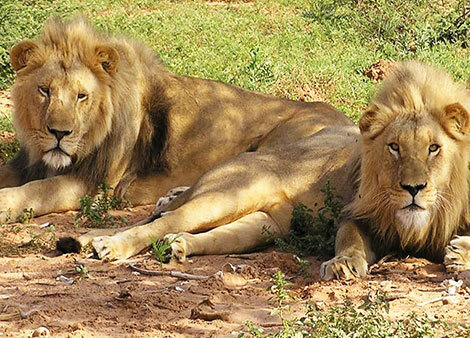 Bhagvan Shree Krishna was resting in meditation pose under a pippal tree when the poacher misread the foot of Bhagvan Shree Krishna as a deer and hit from a distance. The confluence of the three rivers Hiran, Kapila and Saraswati this is the point where the rivers meet the mighty Arabian Sea. 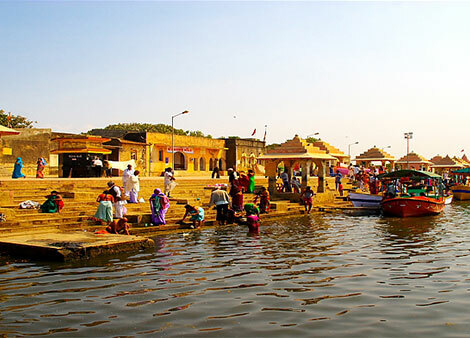 Triveni Sangam is believed to be a very sacred Moksha Tirtha for Hindus. People believe that a dip in the river at this holy ghat cleanses the body and spirit of all sins committed in his life. 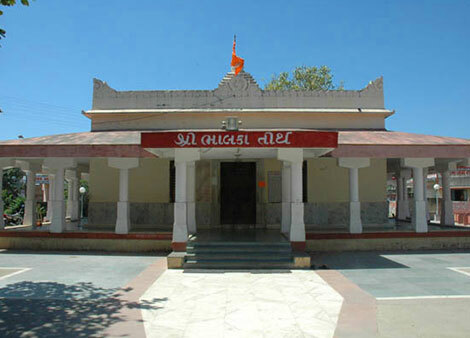 The Laxminarayan and Gita Temple are located on the shores of the ghats. 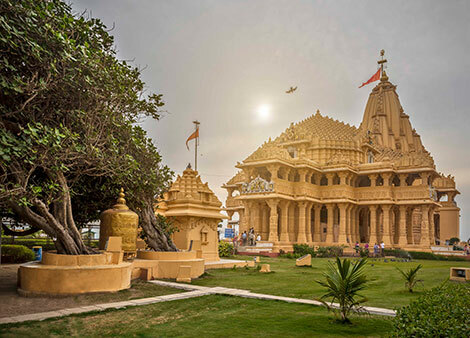 Gita Mandir, also known as Birla Mandir, is one of the popular attractions nearby Somnath. 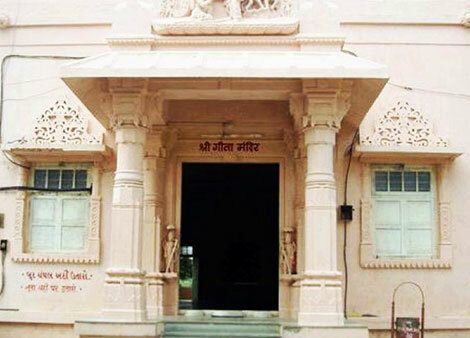 Built in 1970 by the Birlas at Dehotsarg campus situated in the outskirts of Mathura, Gita Mandir is famous for its depiction of Shrimad Bhagwat Geeta, which is carved on 18 marble pillars. The mandir, dedicated to Lord Krishna, is decorated with paintings of Lord Krishna. The sanctum sanctorum also has the idols of Lord Lakshmi-Narayan and Lord Sita Ram on the two sides of Lord Krishna. 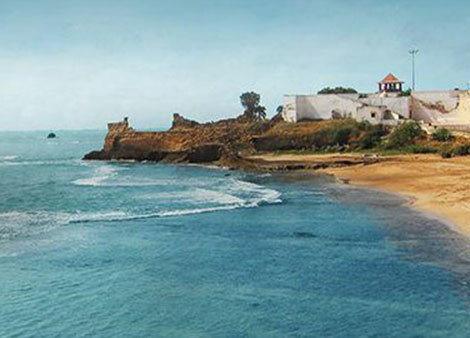 Various tourist attractions in Diu are the Diu Fort, Fortress of Panikota, Nagoa Beach, St. Paul's Church, Jallandhar Shrine, Gangeshwar Temple, Diu Museum, Ghoghla Beach and Gomtimata Beach.